Every student remembers their favorite teacher. Maybe it was the goofy Algebra instructor who made math fun, or the insightful English professor who forever changed the way you look at prose. 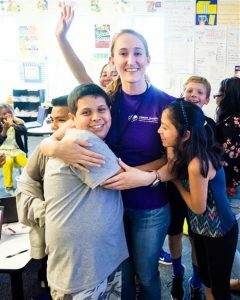 The ones who make an impact always stand out from the rest and for the fifth graders at Green Magnet Elementary School, Courtney Massengill is no doubt a teacher who stands out. Massengill, who is a 2016 WPU graduate, wrapped up her first year of teaching with the distinct honor of being named Wake County’s First-Year Teacher of the Year. The award, known formally as the Diane Kent-Parker First-Year Award, is a prestigious, annual recognition given to only four teachers across Wake County. Principals nominate teachers who’ve made great strides during their first year, for both their students and schools. Nominees are then rigorously reviewed by a committee before a decision is made. Courtney Massengill (center) and students. Photo courtesy of wcpss.net. At the start of her whirlwind first year, Courtney jokingly described herself as being in “survival mode” as she experienced teaching by herself without an assistant. It wasn’t long, however, before she developed and applied her own style of teaching and classroom management, something she attributes to her education at WPU, where she was guided by her professors, cooperating teacher, and the administration. Green Magnet Elementary School is unique in that it has students from all over the world. In her classroom alone, Courtney teaches students represented by seven different countries who speak six different languages. But no matter how overwhelming that could sometimes be, she refers back to the lesson plans, assignments, and skills she learned and acquired at WPU. Overall, the true success of a student can be mirrored in the success of their teacher – that’s why winning such a prestigious award is a reassuring feat for any first-year instructor.